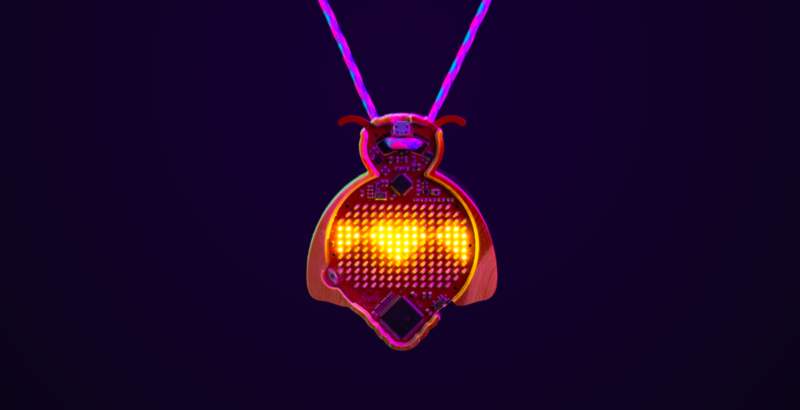 Firefly is a wearable, social light installation. These playful, wearable Firefly pendants, flow through various light sequences, based on human contact and socialization patterns, engaging their audiences into discussion and exchange. From a vantage point the keepers of the fireflies paint an array of light, data and human interaction into a new space. Firefly is an artistic collaboration between Mark Stephenson, Michael Grant and Darcy Whyte originally conceived for Nuit Blanche Ottawa Gatineau in 2018. The project is continues on in a new version by Mark Stephenson and Michael Grant funded through a Media Arts grant from the Ontario Arts Council. These playful, wearable Firefly pendants, flow through various light sequences, based on human contact and socialization patterns, engaging their audiences into discussion and exchange. A new Firefly is in the works. Completely rethought from the ground up to provide a slightly different experience and opportunity for expression as well as addressing some interaction improvements over the original. The design and hardware is complete and we are working on the software. Expect to see some Firefly installations in the next year. The Firefly project was originally conceived for Nuit Blanche. 250 Fireflies we’re distributed at the opening event of the Nuit Blanche Ottawa Gatineau 2013 festival. Firefly V1 was an artistic collaboration between Mark Stephenson, Michael Grant and Darcy Whyte. This project received funding and assistance from RecycleYourElectronics.ca, the Awesome Ottawa Foundation and ArtEngine and has recently received a grant from the Ontario Arts Council for continued development on the project. Version 2 is underway and will be revealed soon.